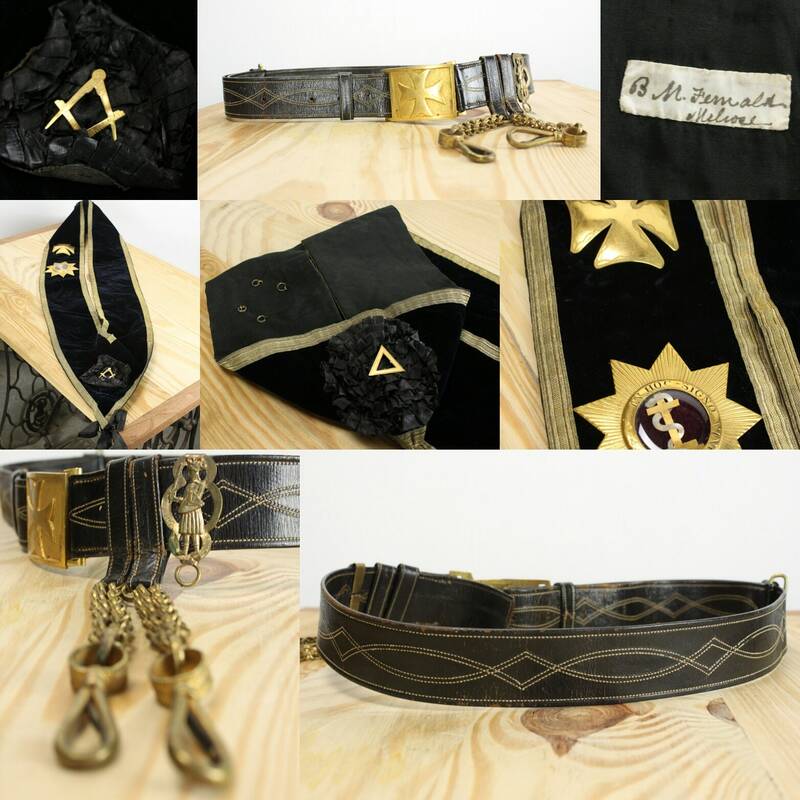 This outstanding, antique, Knights Templar collection is estate fresh from the greater Boston area. 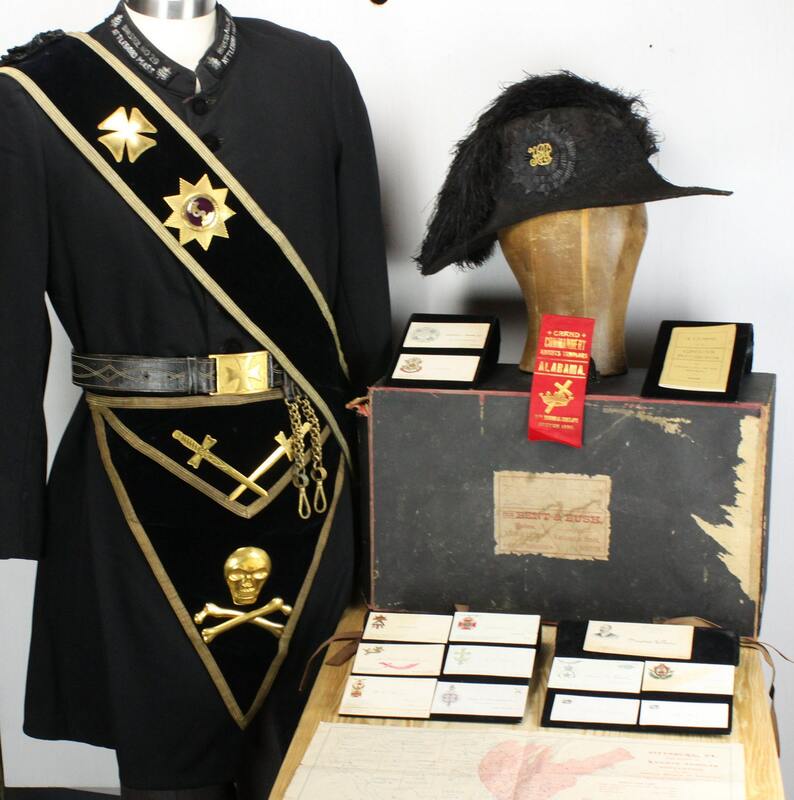 Truly a rare find - this collection not only contains a 19th century Knights Templar's uniform accessories w/ the original box and matching inscriptions (Frock Coat is NOT included in collection) - it also contains an ephemera collection for the 1895 26th Triennial conclave held in Boston, MA! 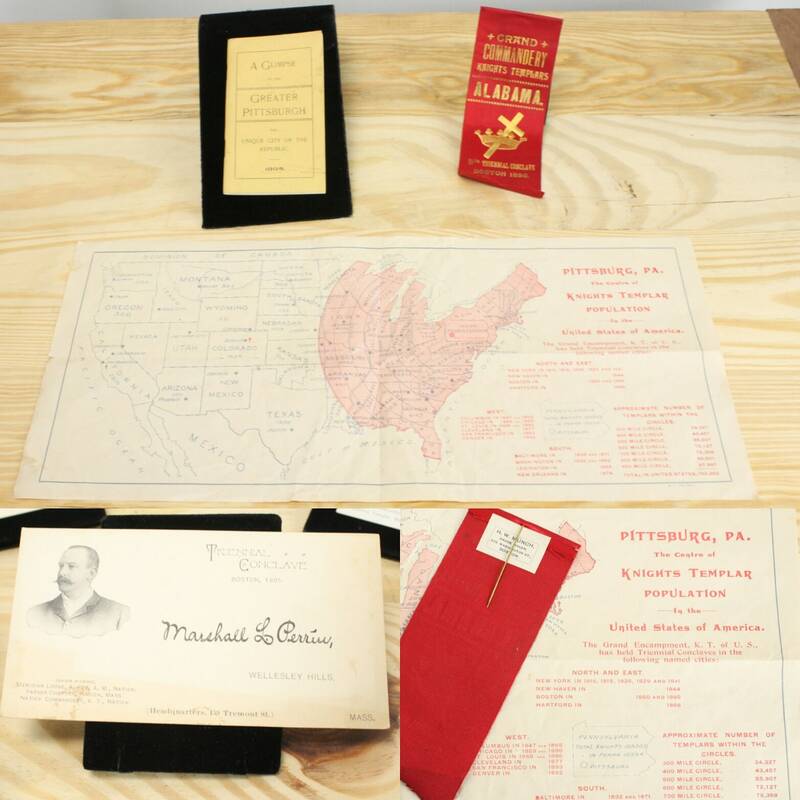 The ephemera collection includes a promotional census map of U.S. Knights Templar population - which names Pittsburg, PA as the center of K.T. population in the United State of America, A Pocket Booklet entitled "A Glimpse of the Greater Pittsburgh - The Unique City of the Republic - 1895". This book is filled with fun facts that make the city of Pittsburgh seem very appealing to a Knights Templar Looking for opportunity. Also, among the lot is a red satin and Gold leaf lapel ribbon from the event and seemingly, for an Alabama Temple. This ribbon is mounted on a brass stick pin and even has the original manufactures label on the reverse side: H. W. MUNCH - Badge Maker - 339 Washington St. Boston. As if That wasn't enough - There is also lot of 13 Late victorian calling cards (all with Masonic & Knights Templar imagery). 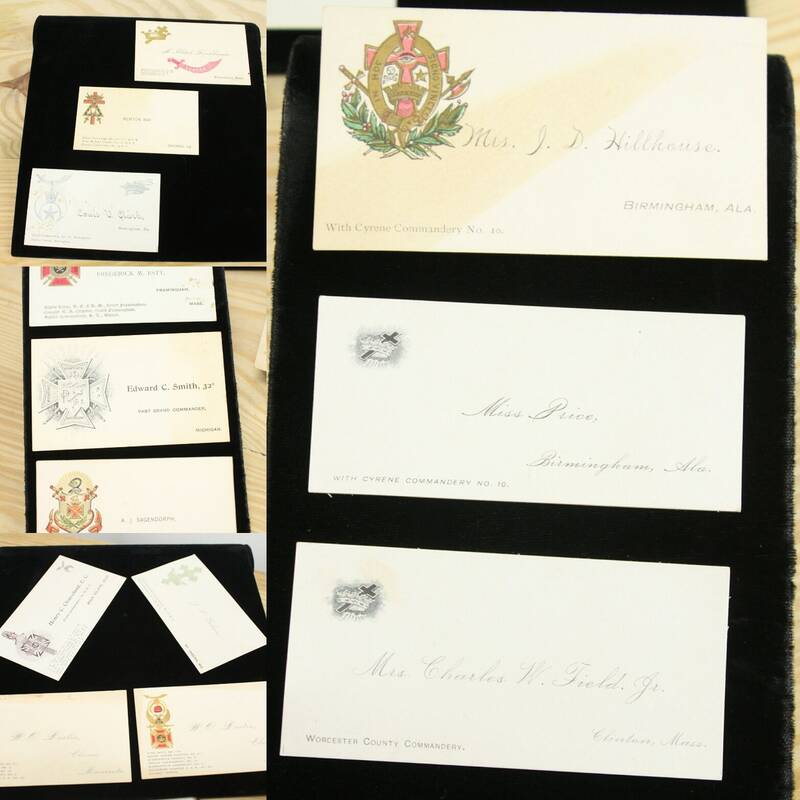 Presumably these cards were collected from the event by the original owner of this uniform - as they are from various areas across america and are contemporary to the time frame of the Triennial Conclave of 1895. Among these amazing and rare pieces of ephemera are 3 Female Templar calling cards and one card that was made expressly for the Triennial Conclave. The box is about 90% complete and is in surprisingly good condition for something that was constructed around 120 yrs ago from paper, cardboard and wood. 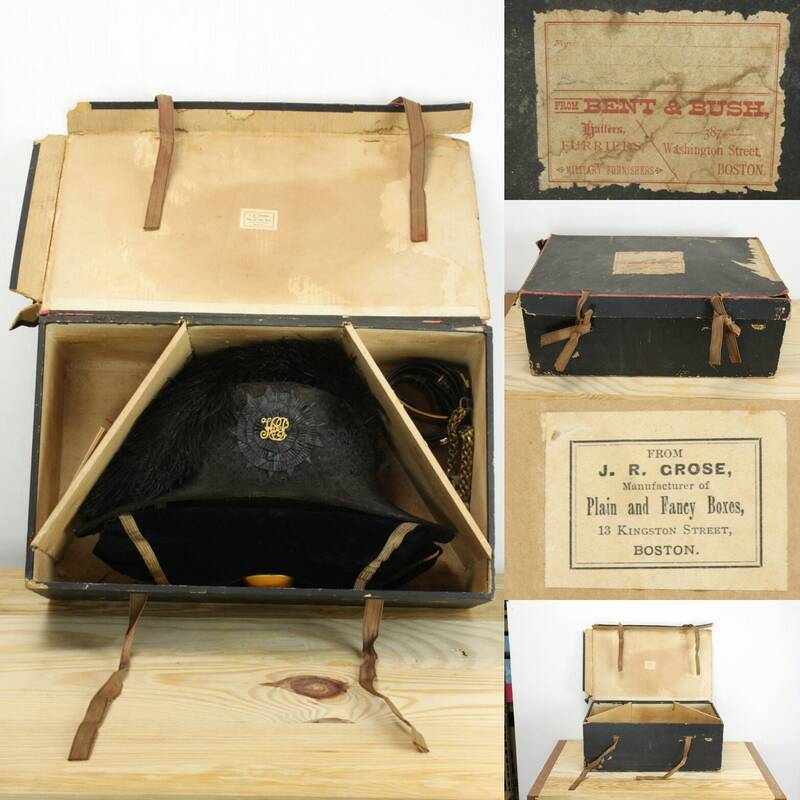 The box is of rectangular shape and features a label on the exterior for the Company that sold the Items (Bent & Bush Hatters, Furriers & Military Outfitters 387 Washington St Boston) and one on the interior for the company that produced the box (J. R. Grose - Manufacture of Plain & Fancy Boxes - 13 Kingstown Street Boston). The Main body of the box is constructed from wood with paper overlay, the lid is cardboard with paper overlay and is missing one side flap. The lid is held closed by two cotton tie bands (one band is damaged). 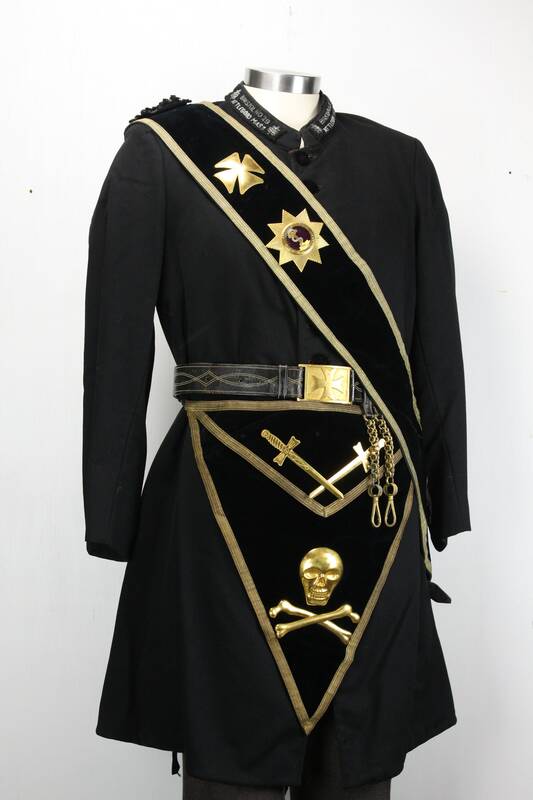 The Hat, apron, sash and sword belt are in spectacular and wearable condition. With the only imperfections are that the hat has some minimal wear the edge of the brim, Some pulls to the applique and a few pulled seams on the band. Other than that the uniform pieces are in pristine condition! 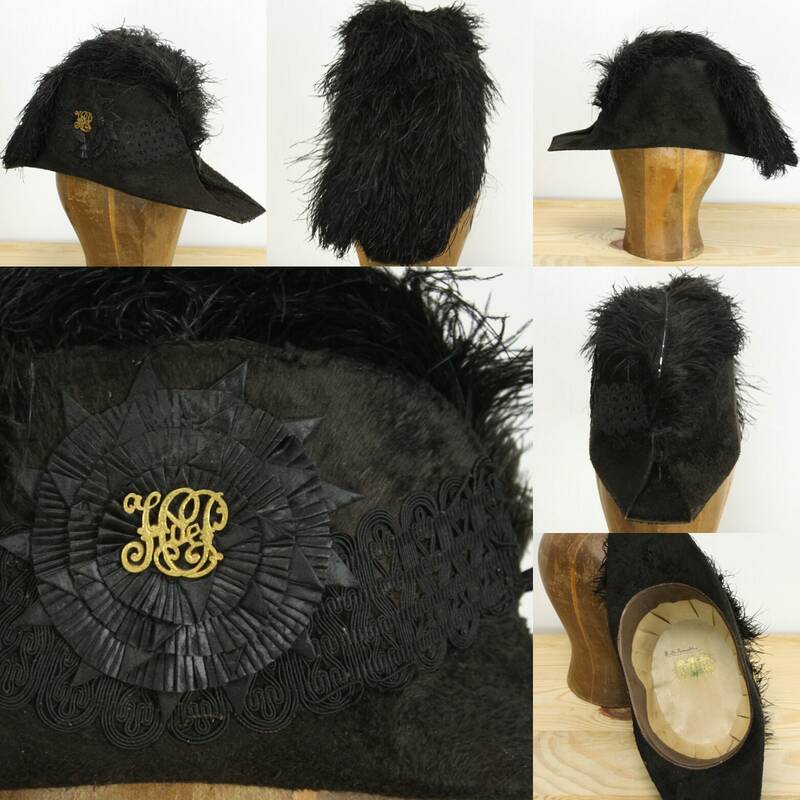 The hat is made of beaver fur over board in the Cocked or Bicorne style and features an ostrich feather plume, a beautiful applique and a paper rosette with a brass emblem. The interior of the hat is lined with folded paper, a leather band and features the Bent & Bush Logo. The hat is inscribed twice with the owners name: B.M.Fernald. 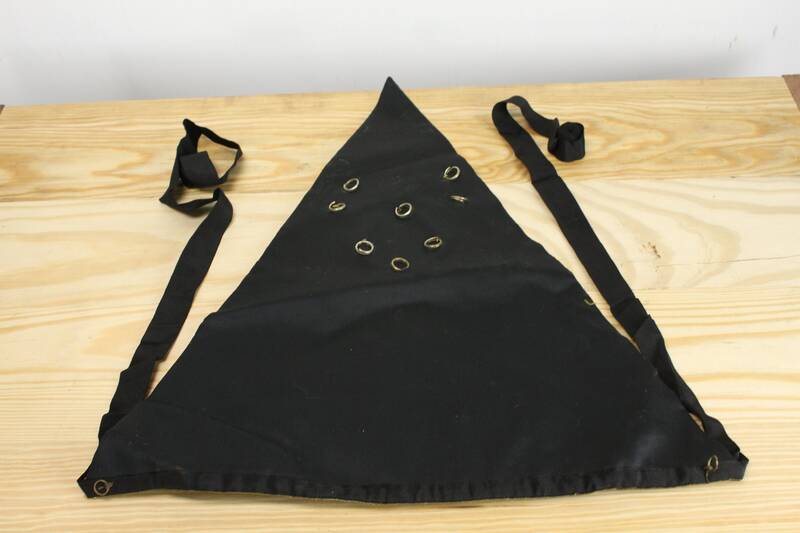 The Sash and apron are made with Black Velvet with black linen lining. 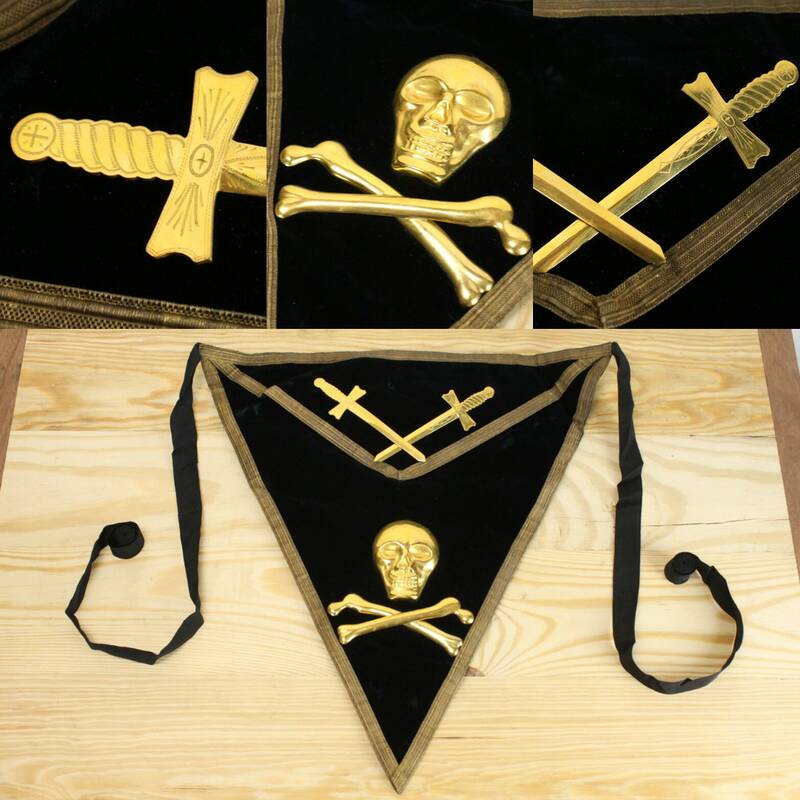 Each is edged with gold bullion trim and adorned with brass emblems. 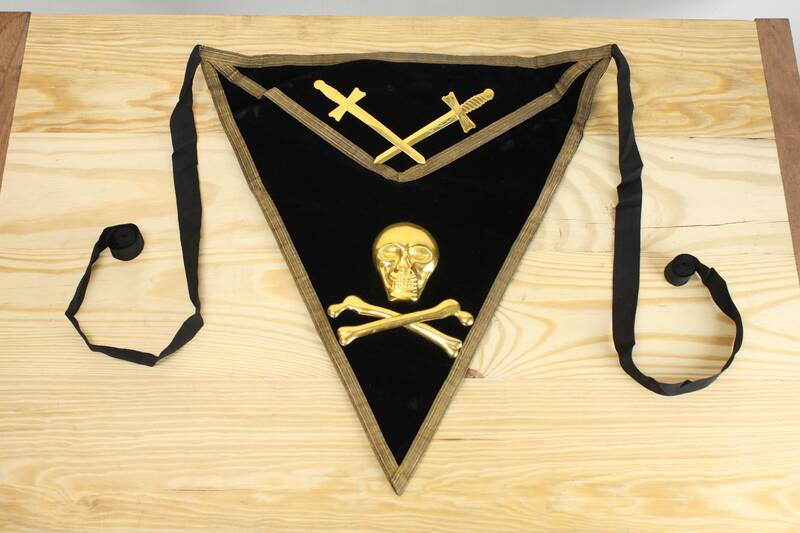 The sash Features two paper rosettes - one at the top and one at the bottom - each with a brass emblem in its center. The sword belt is made of thick leather and features white stitching, heavy brass buckle, brass sword chains & is adjustable. B. Marvin Fernald (B:1847 -D:Unknown) of Melrose, MA - A man so notable that he was given an entire page in the book "Massachusetts of Today". An ambitious ex patriot of N.H. - this Boston transplant became a lawyer of great renowned who eventually married and settled in Melrose, Ma where he became fervently involved in the towns affairs. Mr. Fernald held positions on numerous public committees and was chairman to the committee on Taxation. As chairman of this committee purposed and passed a bill preventing double taxation mortgages on properties - making him extremely popular among the land owners in the of his municipality. Later Mr. Fernald went on to take office in the state senate were he served dutifully (1891 -1892). While on the state senate he chairmanned the Judiciary Committee, The Committee on Constitutional Amendments, The Committee of Public Reservations & The Committee on Insolvency. B. Marvin Fernald was truly one of Americas great sons and lived his live in the service of the Commonwealth! Box: 19" x 11.25" x 7.25"